Inspired by 18th century French Creole Cottages, the slotted shelves and metal legs with cast feet and caps are reminiscent of French Quarter architecture. The Kitchen Cart by Home Styles is constructed of powder-coated gun metal grey steel base, and birch veneers with engineered wood in a vintage caramel finish. Features include 2-push-through storage drawers, 2-slatted fixed shelves, 2-towel bars, and 4-industrial sized casters (2-locking). This cart is beautifully accented with antiqued nickel hardware. Size: 45-inch W x 20-inch D x 36-inch H. Assembly required. Home Styles Cuisine Kitchen Cart in a white with a stainless steel top features solid wood construction, and Utility drawer; 2 cabinet doors open to storage with adjustable shelf inside; Handy spice rack, Towel bar; Heavy duty locking rubber casters for easy mobility & safety. Size: 32.5w 18.75d 35.5h. Thoughtfully crafted and tastefully refined like well-aged Kentucky bourbon. The Country Comfort collection by Home Styles encompasses a traditional design while projecting a well-bred sophistication. The quality is further manifested in the rubber wood solids and veneers. The Country Comfort collection is further perfected with an aged bourbon finish complemented with cup pull antiqued brass hardware accents. The kitchen cart features a wood top, 2 storage drawers with side-mounted metal guides, 2 open slotted shelves and 2 towel bars. Size: 46-inch W x 20.5-inch D x 35.5-inch H.
Orleans Vintage Caramel Kitchen Cart With Towel Bar Inspired by 18th century French Creole Cottages, the slotted shelves and metal legs with cast feet and caps are reminiscent of French Quarter architecture. The Kitchen Cart by Home Styles is constructed of powder-coated gun metal grey steel base, and birch veneers with engineered wood in a vintage caramel finish. Features include 2-push-through storage drawers, 2-slatted fixed shelves, 2-towel bars, and 4-industrial sized casters (2-locking). 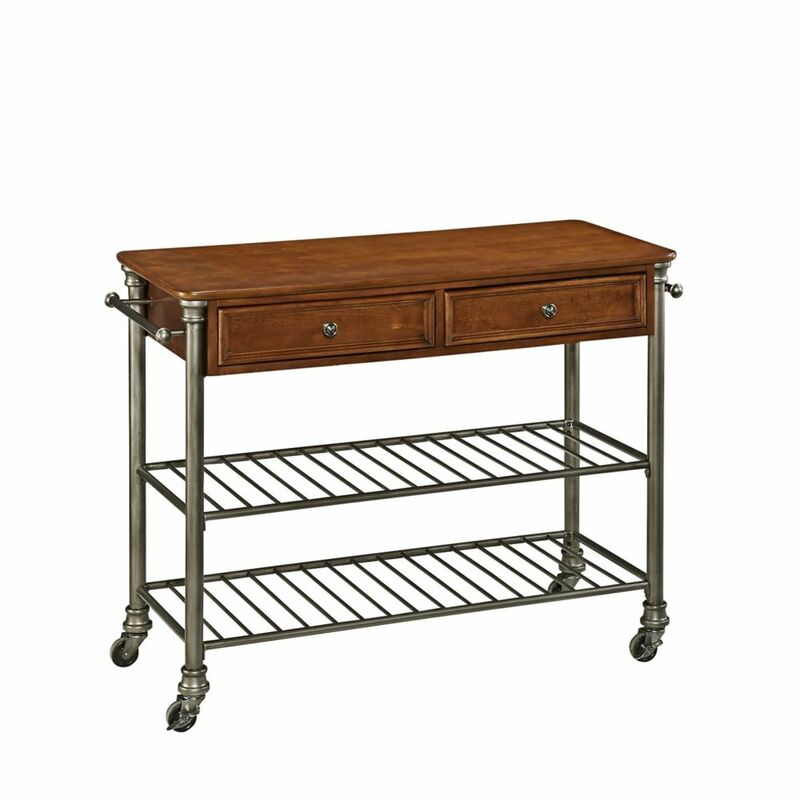 This cart is beautifully accented with antiqued nickel hardware. Size: 45-inch W x 20-inch D x 36-inch H. Assembly required. Orleans Vintage Caramel Kitchen Cart With Towel Bar is rated 4.8 out of 5 by 10. Rated 5 out of 5 by HomeDepotCustomer from Easy to assemble. Took me less than an hour by myself. The metal finish was not as expected , but... Easy to assemble. Took me less than an hour by myself. The metal finish was not as expected , but it is growing on me. Nice addition to my kitchen. Wish the shelves were solid or the bars ran the other way to make it easier to hold my cookbooks. Overall very pleased!! Rated 5 out of 5 by grammarqueen from Is a substantial piece, not like another I tried that... Is a substantial piece, not like another I tried that was very flimsy. Nice finish. Very pleased. Rated 5 out of 5 by christina from very happy with this product perfect size for my kitchen. Everyone that visits that comes into m... very happy with this product perfect size for my kitchen. Everyone that visits that comes into my kitchen remark on how nice it is.